Galahad will come with an entire new Royal Continent. Find out more about the design here! As we started reworking the Outlands, we decided to take the opportunity of the upcoming wipe to also redesign the Royal Isles. 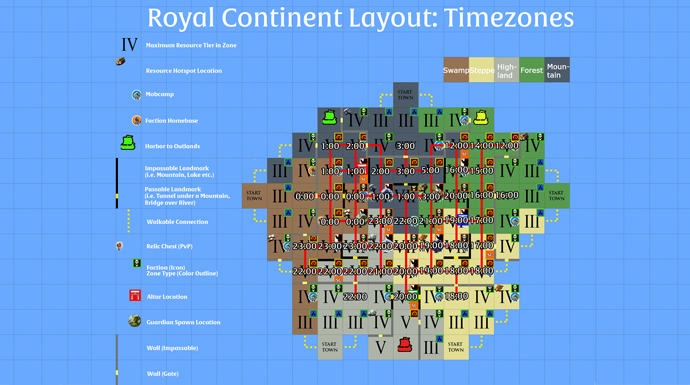 We quickly realized we could make a series of significant improvements with relatively little effort on our end, and create a far better Royal Continent without slowing down our overall game development. 1) There is one dominant city, Queensmarket, turning the other cities into ghost towns. While we do not disagree with having a market hub in Albion, we do not think it should be located next to safe zones as it undermines the idea of transporting good through dangerous areas and full-loot PvP. 2) Similar to the Outlands, this part of the world is simply too big. Not only are there ghost towns, there are also ghost zones and maps. This makes it very hard to find (small-scale) PvP engagements and makes gathering far too safe. There is very little challenge involved. 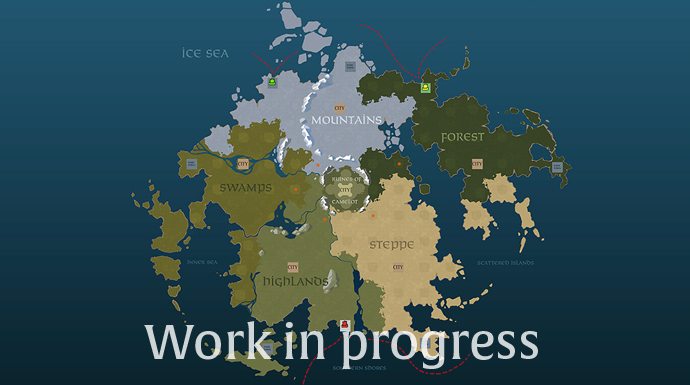 Learning from these two major issues, as well as from the problems we saw in the first Closed Beta, we have decided to get rid of the current two Royal Isles and come up with a new, goal-driven designed Royal Continent. Below you can see technical maps for the new Royal Continent. Do note that this is a work in progress and details might change. Click on an image to open the full version! The new Royal Continent is formed like a pie chart, with each slice being a biome with one city. At the center, where all biomes meet and deep inside the red zones, there is one central city. This city will act as the heart for PvP zones and will have several tunnels leading outside of the city, making its entrances harder to camp. There are also three harbors leading to the Outlands, to the low, mid and high-end part of the Outlands respectively. These harbors are spaced apart in such a way that it is not feasible to use a detour through the Royal Continent if you want to traverse across the Outlands. Aside from that, there are also several passages between regions, providing alternative routes between different parts of the map. Will you risk going through these PvP chokepoints in order to get to your destination faster? The Royal Continent is the place where every adventurer starts their adventure in Albion. It is important to give beginning players a safe environment to start the game, where they learn how to harvest and refine resources, fight mobs, and get to know people. Afterwards they can try their first hand at PvP and eventually transition to the Outlands where they join a guild and enjoy large-scale warfare. There will be five different starter towns, one per biome. Each town will be fairly close to the city of their biome, and offer free travel to other starter town via harbors. The new map design presents a clear progression from green to yellow to red zones, moving towards the center of the Royal Continent. As you progress through the different tiers, you will not only run into higher resources but also encounter different PvE factions. The map tiers in the Royal Continent go up to Tier 7, making them not only very rewarding but also very dangerous zones. Some lower zones in the Outlands might even turn out to be relatively safe compared to these red zone hotspots! The Royal Continent will have a total of six cities, each with a clear identity and custom design. The five biome cities will be placed at the border between safe and yellow zones, and act as their biomes economical hub. The sixth city, placed in the center of the Royal Continent and in the middle of the red zones, will be the PvP-zone hub. 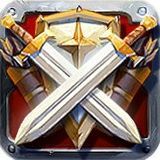 As it is closest to all resources and the highest tiers, we expect PvP to happen on a constant basis. As each city plays their own role in the economy, trading in between them is encouraged. 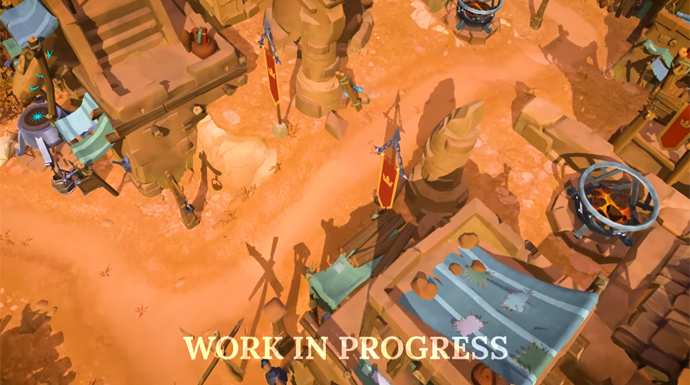 This makes sure transportation and logistics have their role in Albion Online. It is up to you to pick the trading route of your choice: do you stay in the outer parts of the Royal Continent and stay in the safe zones, or do you go through the center and face the possible consequences? Perhaps you might consider taking along players to protect you, as you explore one of the dangerous passages in the world. In the new Royal Continent, each zone will have its purpose, reducing the amount of dead and unused zones to as little as possible. This is not only done by removing redundant cities, but also by reducing the overall size of the map. If the continent were to become overcrowded, players will be encourage to explore the Outlands instead. In extreme cases, we could also adjust the spawn rates on the Royal Continent. While big guilds can have it their way in the Outlands, the Royal Continent is the place to be for small-scale PvP. By having the red zone hot spots in the center the continent, with an abundance of interesting objectives, we want to encourage PvP in the red zones. The reputation system will function as a safeguard, ensuring that big zerg guilds will not be profitable or viable in the Royal Continent, forcing them to go to The Outlands instead. It is time to say goodbye to the current chessboard-style world map, as we are de-gridding the world map to give it a more natural and believable look. We are excited to hear your thought and feedback regarding the new Royal Continent. Make sure to let us know what you think in the comments below or on our forums!